This needle punch was designed and punched by me. 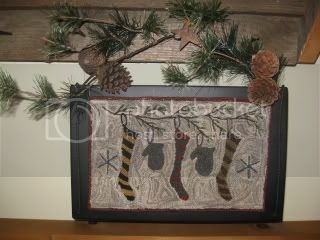 I have 3 different colored striped stockings and 2 old grey mittens hanging from an evergreen bough with 2 snowflakes accenting the sides. I did my punching on coffee dyed weavers cloth using the 6 strand method with dmc and valdani thread. I mounted the needle punch to a painted black tin with an acid free adhesive. 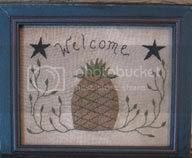 There are holes in each of the corners and I ran a wire evergreen and pinecone swag up and through the holes for hanging. The is also a little rusty star attached to the top of the swag. Measurements are 12"w x 8"L. A unique piece for your Holiday decorating this year and for years to come.